Third Rail Press, 9780996131001, 82pp. 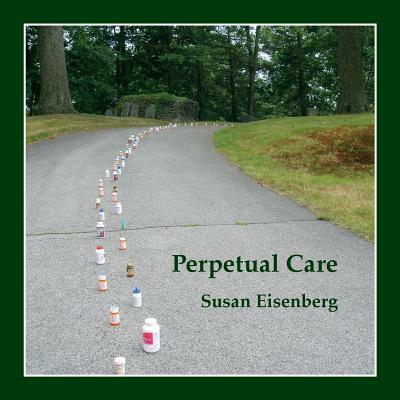 Poet and visual artist Susan Eisenberg's fourth collection lyrically explores the particular doctor-patient relationships, medical experiences, encounters, and adjustments of longterm chronic illness. Perpetual Care takes the reader from "whirlpools/of symptoms that shifted shape," through diagnosis of lupus and thyroid cancer, to navigate between scares and dailiness. Striking fine art photographs of her medication bottles traversing a Victorian cemetery through changing seasons, complement these strong poems. "In this powerful collection, Eisenberg captures the essence of being a patient in the modern health care system. Always poignant, at times playful, Eisenberg's economical and evocative words allow the reader to experience the full array of emotion associated with being a patient. I have shared these treasures with my patients and professional colleagues alike. So real, so true, so honest--at times breathtaking "
"Incisive, lively, witty, Perpetual Care brilliantly defies its subject matter. Using an impressive range of forms, styles, and metaphors, Susan Eisenberg draws us deeply into the emotional complexities of a 'flock of illnesses.' Whatever your background--as patient and/or provider--you will find this book difficult to put down. The poet's striking photographs add resonance to both the title and these surprisingly hopeful poems."